Subutai (Classical Mongolian: Sübügätäi or Sübü'ätäi; Tuvan: Сүбэдэй; Modern Mongolian: Сүбээдэй, Sübedei; Chinese: 速不台 1175–1248) was an Uriankhai general, and the primary military strategist of Genghis Khan and Ögedei Khan. He directed more than 20 campaigns in which he conquered 32 nations and won 65 pitched battles, during which he conquered or overran more territory than any other commander in history. He gained victory by means of imaginative and sophisticated strategies and routinely coordinated movements of armies that were hundreds of kilometers away from each other. He is also remembered for devising the campaign that destroyed the armies of Hungary and Poland within two days of each other, by forces over 500 kilometers apart. By any metric, he is one of the most successful commanders in history. Historians believe Subutai was born in the year 1175, probably just west of the upper Onon River in what is now Mongolia. He belonged to the Uriankhai clan, known as the reindeer people, a group of Siberian forest-dwellers who did not live like the plains Mongols to their south. As a result of his upbringing, Subutai lacked the natural horsemanship training from birth that all Mongols possessed, making him an outsider among them. Subutai's family had been associated with the family of Temujin (future Genghis Khan) for many generations. Subutai's great-great grandfather, Nerbi, was supposedly an ally of the Mongol Khan Tumbina Sechen. Subutai's father, Jarchigudai, supposedly supplied food to Temujin and his followers when they were in dire straits at lake Baljuna, and Subutai's elder brother Jelme also served as a general in the Mongol army and was a close companion of Temujin. 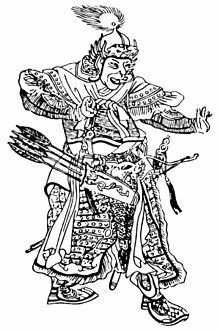 Jelme rescued a severely wounded Temujin (hit by an arrow from Jebe, then an enemy) in the process of unification of the Mongolian plateau. Another brother, Chaurkhan (also romanized as Ca'urqan) is mentioned in the Secret History of the Mongols. Subutai's biography in the History of Yuan opens up with a peculiar anecdote about the general's early life. Subutai's father was once driving a herd of sheep in order to present them to his overlord, Taizu (Genghis Khan). Encountering robbers, he was seized. Huluhun (Subutai's brother) and Subutai arrived in good time, and with their lances stabbed some of the robbers. Horses and men fell together, and the remainder of the band withdrew and departed. Consequently, they relieved their father's difficulty, and the sheep were able to attain the emperor's station. They are the Four Dogs of Temujin. They have foreheads of brass, their jaws are like scissors, their tongues like piercing awls, their heads are iron, their whipping tails swords . . . In the day of battle, they devour enemy flesh. Behold, they are now unleashed, and they slobber at the mouth with glee. These four dogs are Jebe, and Kublai (different than Kublai Khan), Jelme, and Subotai. Subutai seems to have been identified from early on by Temujin as special, and given rare opportunities for growth. Appointed to the prestigious post of Genghis Khan's ger (yurt) door guard during his teen years, Mongol histories say that Subutai said to Genghis Khan, "I will ward off your enemies as felt cloth protects one from the wind." This access enabled him to listen on, and later join, the Mongol strategy meetings somewhere around his late teens and early twenties. Throughout most of Genghis Khan's lifetime, Subutai would have the opportunity to apprentice on detached missions under the elite Jebe (1211–12, 1213–14, 1219–23) and Muqali (1213–14), in addition to Genghis Khan himself (1219). It is likely that his unique access to the most brilliant Mongol leaders assisted his growth. Subutai's first chance at independent command came in 1197, when he was just 22 years old. This boon occurred during the war against Genghis Khan's most hated enemy, the Merkit. Subutai's role was to act as the vanguard and defeat one of the Merkit camps at the Tchen River. Subutai refused Genghis Khan's offer for extra elite troops, and instead traveled to the Merkit camp alone, posing as a Mongol deserter. Subutai managed to convince the Merkits that the main Mongol army was far away, and they were in no danger. As a result, the Merkit lowered their guard and limited their patrols, allowing the Mongols to easily surprise and encircle the Merkits, capturing two generals. This is evidence that even in his formative years, Subutai was a highly unorthodox general who found innovative ways to cheaply solve problems with few casualties. He also served as a commander of the vanguard with distinction in the 1204 battle against the Naiman that gave the Mongols total control over Mongolia. Subutai was a major innovator in the art of war, and his later campaigns demonstrated an unprecedented level of complexity and strategy not seen again until World War II. In the invasions of China, Russia, and Europe, Subutai routinely coordinated armies of ~100,000 men across frontages separated by 500-1,000 km and between 3 and 5 separate army groups. These maneuvers were highly synchronized despite the enormous distances: the Mongols defeated the main army of Poland and Hungary in separate battles two days apart. Subutai's maneuvers were designed to mislead his foes and strike them from unexpected directions. The Mongol invasion of the Jin in 1232 continually pulled the hitherto successful Jin forces apart despite their highly advantageous terrain, as they could not determine which Mongol armies were the feints and which were the true threats until their main army became isolated and starved. Strongly fortified locations would be bypassed and ignored until all organized resistance had been destroyed. Sieges would be limited to critical or vulnerable locations; in other situations, the Mongols either left a blockading force, or simply ignored fortified citadels and devastated the surrounded agriculture so that the remaining people would starve if they remained within fortified walls. Due to his long tenure of service, Subutai had the opportunity to face off against elite armies of all types from west to east, and emerged triumphant in every campaign. The horse archers of other great steppe confederacies, the elite Jurchen cavalry of China in the 1230s, the seasoned Qangli Turk cavalry of the Khwarezm, fresh from conquering their own Empire, and the heavily armored knights of Georgia, Poland, and Hungary were all powerless against Subutai's armies. In contrast to the common perception of steppe horse archer armies slowly weakening their foes with arrows for many hours or even days, such as at the battle of Carrhae or the battle of Manzikert, Subutai fought in a much more decisive and fluid manner where heavy firepower was used to create openings for rapid cavalry charges with deep formations. At the battle of the Kalka River in 1223, Subutai's 20,000 man army routed the 80,000 man Russian army by stringing it out after a 9-day retreat, and then immediately turning and delivering a decisive charge without a prolonged missile bombardment. The vanguard of the Russian army was already put in flight before the second wave even reached the battlefield and began to deploy. Subutai was one of the first Mongol generals, alongside Genghis Khan, who realized the value of engineers in siege warfare. Even in field battles he made use of siege engines. In the Battle of Mohi, the Hungarian crossbowmen repelled a night bridge crossing by the Mongols, and inflicted considerable casualties on the Mongols fighting to cross the river the following day. Subutai ordered huge stonethrowers to clear the bank of Hungarian crossbowmen and open the way for his light cavalry to cross the river without further losses. This use of siege weapons was one of the first recorded uses of artillery bombardments against the enemy army to disrupt their resistance while simultaneously attacking them. In execution, his usage functioned more akin to the creeping barrage of World War I, used to soften and disrupt enemy lines right before an attack. While the stonethrowers were clearing the path to cross the main bridge, Subutai supervised construction of another temporary bridge downriver to outflank the Hungarians. The Hungarians, focused on the attack at the bridge and knowing that the Sajo river was too deep to ford, did not expect the Mongols to be able to create a pontoon bridge, especially at night. Subutai's engineering ingenuity extended to the totally unique use of smokescreens to shroud key areas of the battlefield. At the battle of the Kalka and the battle of Liegnitz, the Mongol armies drew portions of their foes armies away from their comrades, and used smoke to obscure the enemy vision and prevent them from seeing their isolated units encircled and destroyed. Subutai was also well known for incorporating conquered peoples who brought specialized skills into his forces, especially engineers. He was skilled at intelligence gathering and planning his campaigns well in advance. For instance, he used spies to gather detailed information on the Russian principalities, the Poles, and the Hungarians at least a year before the attacks on each. His European adversaries were stunned by the intricacy of the Mongol espionage networks. He tailored his strategy to match the enemy, adjusting his tactics according to the opponents, the terrain, and the weather as required. He emphasized the use of light cavalry in his army, maneuvering the enemy into feints and ambushes, and efficiently pursuing and defeating broken armies to destroy further resistance. Subutai kept his forces in line with the Mongol tradition of dispensing with excess baggage train and ensured his troops could efficiently live off the land and rapidly advance great distances on campaign. He preferred to maneuver the enemy into a position of weakness before committing to battle. Subutai was very vigilant about conserving Mongol lives, and would devise elaborate strategic maneuvers or conduct frequent massacres to terrorize populations into submission so as to limit future casualties. Like Genghis Khan, Subutai was a master at creating divisions within the enemy ranks and surprising them. The terrifying Mongol reputation, combined with highly effective spy networks that spread discord, as well as incentives to key local leaders, prevented his opponents from effectively uniting and fighting at their full capacity. Oftentimes enemy resistance simply collapsed when the Mongols drew near, or they were simply paralyzed and didn't take action in time. When attacking the Merkits, Subutai repeatedly deceived them into thinking his armies were far away, only to surprise and surround them. 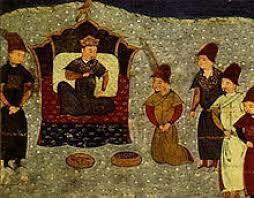 In Khwarezm, the Mongols created a rift between the forces loyal to the Shah's mother and the Shah's own armies, all while harrying the Shah to prevent him from fixing the situation and rallying armies. In Georgia, civilian massacres lured King George IV's army into the open, while north of the Caucasus, clever diplomacy sundered the alliance between the nomadic Cumans and the local Alans and Circassians. In 1217, Genghis Khan sent Subutai to hunt down the hated Merkits and their allies, the Kipchak/Cuman confederacy, in modern-day central Kazakhstan. Subutai defeated them on the Chu River in 1217 and again in 1219 in Wild Kipchak territory. Before the battle of the Chem River in 1219, Subutai had his vanguard carry children's toys and leave them behind, as if they were a group of families fleeing from the Merkit. As a result of this deception, Subutai's army was able to surprise, encircle, and capture of all the Merkit/Kipchak leadership. Mohammad II of Khwarizm attacked Subutai shortly afterwards along the Irghiz River. Despite being outnumbered 3:1 against the Sultan's elite forces which had conquered much of Central Asia, Subutai held him off after a fierce battle and retreated during the night. According to Persian sources, this battle seems to have eroded Mohammed's confidence in his ability to defeat the Mongols in pitched battle, since Subutai only commanded a small 20,000 man force and did not want to even fight him. Supposedly the Mongol army had destroyed his left wing, and nearly broken his center and captured him, until reinforcements from his son arrived and the battlefield turned dark. Because of this battle, Mohammed was unable to take advantage of the upheaval in the Khara-Khitai Empire (simultaneously being conquered by the Mongolian general Jebe), like he had in earlier wars. Genghis Khan led the Mongol army westwards in late 1219 to invade Khwarizm as retaliation for the execution of Mongol ambassadors. With roughly 100,000 armed men, the Mongol army was numerically inferior to the forces of the Khwarizim Empire, but through deception and rapid maneuver, the Mongols defeated the isolated Khwarezm armies in detail before they could react. Serving as the Mongol equivalent of Genghis Khan's Chief of Staff, Subutai marched with the Khan's army through the deadly Kyzylkum Desert to emerge behind the Khwarezm defense network at Bukhara. After the rapid capture of the Khwarezm center of defense, Samarkand, Genghis Khan dispatched Subutai and Jebe with 30,000 men to hunt the Khwarezm Shah and prevent him from rallying the other Khwarezm armies. Shah Mohammad attempted to save himself by fleeing into central Persia, but while he eluded capture, the relentless chase meant he could not rally his forces. As a result, the several hundred thousand man Khwarezm forces in reserve remained divided and were easily destroyed piecemeal by Genghis Khan's main army. Drained by the fierce pursuit, Mohammed fell ill and died at a fishing village on an island in the Caspian Sea in early 1221, an ignominious end for the man who styled himself the 'Second Alexander'. Subutai and Jebe spent part of the 1219 winter in Azerbaijan and Iran, raiding and looting while preventing the western Khwarezm forces from assisting the rest of the empire to the east. Here he conceived the idea of conducting the most audacious reconnaissance-in-force in history, which was described by Edward Gibbon as [an expedition] "which has never been attempted, and has never been repeated. ": 20,000 Mongol forces would circle the Caspian Sea through the Caucasus Mountains to fall on the rear of the Wild Kipchaks and Cumans. Subutai apparently rode 1200 miles in a week, even sleeping in the saddle while his horses rode on. After destroying resistance in Persia and submitting Azerbaijan, the Mongols invaded the Christian Kingdom of Georgia. Though the Georgian King was reluctant to actually commit to battle, Subutai and Jebe forced his hand by ravaging the countryside and killing his people. Subutai and Jebe then defeated a powerful Georgian army with many thousands of knights at the Battle of the Caucasus Mountains, by luring the knights away from their infantry with a feigned retreat, then enveloping the knights. After destroying them, the Mongols encircled and crushed the Georgian army. Subutai, who was identified by the Georgians as being in command, originally lured the Georgians into thinking his army was a friendly ally by having his men in front parade crosses, and using spies to start false rumors that the Mongols were actually Christian wonder-workers who had come to assist the Georgians. This Mongol reconnaissance mission may have inadvertently altered the history of the Crusades, as Georgia had planned on sending their now destroyed army to join the 5th Crusade. Instead, King George's sister Rusudan had to write to the Pope to explain that they could not assist the Crusade because their whole army had been disintegrated. Though Georgia lay defenseless after these catastrophic defeats, the Mongol mission was to raid and scout, not conquer. After ravaging Georgia, the Mongols cut across the Caucasus Mountains during the winter to get around the Derbent Pass. The Mongols were tricked by their guides into taking a perilous route and emerged from the mountains exhausted, only to be confronted with a far larger steppe coalition army. Using clever diplomacy, Subutai isolated and defeated the Alans, Circassians, and Don Kipchaks/Cumans in detail. After plundering the southern Russian steppes, the Russian princes united with the retreating Cuman confederacy to defeat the Mongols with an 80,000 man host. Despite being heavily outnumbered, Subutai sacrificed the 1,000 men of his rear guard to induce the coalition army to recklessly pursue him and become separated. After 9 days of pursuit, Jebe and Subutai suddenly turned and crushed the combined Rus and Cuman army at the Kalka (31 May 1223). In addition to destroying all the armies in their way and setting up their own espionage network, the Mongol leaders made a strategic alliance with Venetian traders that would reap great rewards a decade later. In exchange for giving them exclusive trading rights, the Venetians would act as Mongol spies in Europe. The Volga Bulgars claimed that they had ambushed Subutai's army, but historians have doubted this account in light of the Mongols seeking out and defeating the Qangli Turks in southern Russia shortly afterward. Subutai was sent to Central Asia in 1229 and again defeated the Cumans/Kipchak confederation before he was recalled to China. In the initial invasion of the Jin in 1211, Subutai served with Jebe's army that attacked the Chinese forts around the eastern edge of the Great Wall (not the Ming Great Wall). In late 1211 he was the first to scale the walls of the key fortress of Huan-Chou, and took part in the ambush of a major Jin army at Wu Sha Pao and the climactic battle of Yehuling. In 1212, he may have served with Jebe during the latter's daring capture of Liaoyang, and in 1213 he served with Muqali and Jebe in a great raid in Shandong. Subutai played a key part in the campaign against the Tanguts of Xi Xia in 1226, serving as commander of the flank army to strike the Tanguts in the rear. While Genghis invaded the Xi Xia by a more traditional northern route, Subutai unexpectedly attacked from the west over the mountains and inhospitable deserts in modern Turkestan, causing Tangut resistance to collapse. The Tangut Empire was cut in two: with Genghis preventing reinforcements being sent west, Subutai subdued resistance in the west and joined with Genghis's main army to conquer the east. In 1227, he conquered the Jin districts along the upper Wei River, and even raided the Kingdom of Tibet. Though the Mongols conquered Xi Xia, Mongol operations against Jin China were interrupted by the death of Genghis Khan in 1227. Genghis Khan was succeeded by his son Ögedei in 1229. Subutai's final campaign in China is likely his greatest feat. After a humiliating defeat by the resurgent Jin in 1230–1231, Ögedei personally led the main Mongol army against the Jin (in Central China) and appointed Subutai to salvage the situation. Subutai had originally been assigned to conquer the Kipchak Turks in central Russia in 1229, but was hurriedly recalled to China in 1229-1230 after the Mongolian general Dolqolqu suffered a major defeat. Against Subutai, the Jin generals retreated from Shaanxi and implemented a scorched earth policy to hold the fortified Tongguan Pass and block any access to the Jin stronghold of Henan. They calculated that the scorched earth policies would deny the Mongols the ability to sustain a lengthy siege, and their lines of fortifications and difficult terrain would prevent the Mongols from outmaneuvering them. This campaign would provide the most difficult of Subutai's lengthy career, as he was up against a highly competent general with a seasoned army that probably numbered over 200,000, and had no qualms about ruining his own people's land in order to stave off the Mongols. Subutai initially attempted to outflank them by feinting an attack at the fortified location of Weizhou and maneuvering through an unguarded side corridor. Though the Jin were fooled by the feint, they moved with great alacrity once Subutai's main advance was discovered, and the attempt to break into the plains of Henan ended in failure after Subutai's advanced raiding parties were checked at Shan-ch’e-hui. The Mongols defeated a relieving force and captured Fengxiang, a secondary target, by concentrating 400 trebuchets at a corner of the wall. However, the overall campaign seemed to have reached a stalemate. In 1231–1232 Subutai made another attempt to outmaneuver the Jin fortified lines by using a similar highly audacious approach that they had employed in Khwarezm (1219) and Xi Xia (1226). The Mongols divided into three armies, one to attack Henan from the North in the center of the Yellow River, another to attempt to cross the Yellow River in Shandong in the east, and the last, under Subutai and Tolui, invading the Song Empire and attacking Henan from the more exposed south. The Song initially refused to allow the Mongols passage through the rugged Qinling mountains, so Subutai dodged their forces and isolated the mountain citadels one by one. Disheartened by the ease of the Mongol advance against their strong fortifications, the Song agreed to supply guides. This time Subutai was able to outmaneuver the Jin armies and cross the Han River to invade Henan from the south. The main Jin army promptly marched to intercept Subutai's army at Mount Yu. Its commander, Wan Yen Heda attempted to ambush the Mongols, but the ambush was detected. In turn, the Mongols attempted to draw him into their own ambush with a feigned retreat, but he held his strong position. After a full day of fierce fighting that resulted in a stalemate, the Mongols retreated under darkness and attempted to hide their trail and outflank the Jin. Wan Yen Heda had retreated towards the city of Tengzhou in order to obtain supplies. Changing tracks, Subutai, identifying that the Jin were vulnerable to attrition, used a feint attack to temporarily divert the Jin forces away from their supply train, which he promptly seized with a hidden force. Rather than continually attempting to attack the vigilant Jin during their retreat, Subutai instead dispersed his army into several detachments to target supplies in the area. 3,000 men masked the Mongol dispersion and occupied the Jin's attention, while other Mongol forces slowly slipped away from the field in small numbers to hide their movements towards the Jin capital of Kaifeng, the route that Wan Yen Heda was retreating along. With part of his force harassing the Jin army's foragers, the other units marched around the flanks in a wide arc and emerged ahead of the Jin army, aiming to destroy or steal the supplies of nearby villages along the Jin's line of retreat. Ogedei Khan had been able to cross the Yellow River after the Jin army blocking him had to march south to help Wan Yan Heda. With Subutai's army having maneuvered along the Jin rear, Ogedei was able to send reinforcements to Subutai, bringing the total Mongol strength to 50,000 men. After these reinforcements arrived and with the Jin army's food supplies severely depleted over the past three weeks, Subutai forced a battle on his terms and won a decisive victory at the battle of Sanfeng Mountain (9 February 1232), capturing Wan Yen Heda and annihilating the main Jin army which had nowhere safe to retreat to. He then made forced marches and eliminated the other Jin armies holding the other fronts at the battles of Yangyi (24 February 1232), and T’iehling (1 March 1232). After the battle, the Jin commander Wan-Yen Heda, the only general in history who was the victor in three different battles against the Imperial Mongol army, was captured: his last wish was to meet with Subutai to pay his respects to the legendary general: "It is not chance but destiny that makes conquerors such as you. Having seen you, I am ready to die!" Ögedei and the main Mongol army returned to Mongolia, leaving Subutai with a small force to complete the conquest of Henan. The heavily fortified city of Kaifeng, certainly one of the strongest in the world, required an eight month long siege. Subutai was forced to construct lines of circumvallation that had a perimeter stretching 54 miles. Additionally, the Jin began to employ a cutting edge gunpowder weapon called 'Thunder Crash Bombs,' which made it very difficult for the Mongols to get close enough for more concentrated fire. After cutting off Kaifeng from any outside help, Subutai alternated intense bombardments using a mixture of Muslim trebuchets, mangonels, and captured gunpowder with periods of rest and plundering the countryside. The Mongol dispersion helped them avoid contagion by the plague that devastated Kaifeng, and after being stretched to the limit, the Emperor fled and the city surrendered. Subutai originally wanted to execute everyone in Kaifeng to punish them for their intransigence and extremely long resistance. However, Ogedei intervened and ordered Subutai to treat them fairly. Though ruthless, Subutai followed orders and efficiently distributed food and water to the starving residents. During the siege, the Mongol besieging force had run very short on food. To solve this problem, Subutai made an alliance with Song to get help to complete the job in mid-1233. With Song help, the last Jin stronghold of Caizhou fell in 1234. However, it did not take the Song long to fall out with the Mongols. Two Song armies seized Kaifeng and Luoyang during the summer of 1234 during Subutai's absence. Subutai returned, destroyed the three Song armies by isolating and defeating them in detail, and retook the cities. He then made a preemptive raid into Song territory to force them to adopt a defensive position. Though war had begun between the Mongols and Song, Subutai was recalled to the west. Still, Subutai's victories had taught the Song a lesson they would heed: no Song army would dare venture north to attack Mongol territory afterward. Unlike in 1222-23 when the majority of the Rus states allied against Subutai and Jebe, this time the Mongols apparently struck with such speed that the Russians were either too paralyzed, or possibly too bitter or distracted to ally. The Mongols also made a false pact with other principalities to forestall the possibility of any alliance. Hence the Mongols, dashing across the vast terrain of western Russia in the winter, were free to concentrate their forces against the isolated Rus principalities. In late 1237, Subutai attacked Ryazan and Vladimir-Suzdal, operating with three columns (attacking as the Mongols usually did during the winter, when the rivers froze over). The Rus forces were defeated in 3 separate engagements and their cities were taken in quick succession. The Mongols spent the summer of 1238 resting along the Don River. Columns were sent out to subjugate the various tribes living in the plains around the Black Sea. In 1239, the Rus state of Chernigov was defeated and their cities were taken. The Mongols were spared the need to conquer Novgorod when the principality smartly surrendered, agreed to pay tribute in the future, and gave the Mongols a large bribe. The notable encounter of the campaign was the battle of the Sit River in 1238. The Grand Duke Yuri of Vladimir, the most prominent of the Rus leaders, had left Vladimir to raise an army and defeat the Mongols before they reached his city. However, the Mongols evaded his army and captured Vladimir before he even knew what had happened. When Yuri sent out a strong reconnaissance force to penetrate the Mongol scouting screen, his lieutenant told him in horror that his army was already entirely surrounded. Not surprisingly, Yuri and his army were easily defeated. The Mongols had made a treaty with Galich-Vladimir, whose prince was therefore taken by surprise when the Mongols suddenly attacked in December 1240. Kiev, Vladimir, and other cities were quickly taken. The attack on Europe was planned and carried out by Subutai, who achieved his lasting fame with his victories there. Having devastated the various Russian principalities, he sent spies as far as Poland, Hungary, and Austria in preparation for an attack into the heartland of Europe. Having a clear picture of the European kingdoms, he brilliantly prepared an attack nominally commanded by Batu Khan and two other princes of the blood. While Batu Khan, son of Jochi, was the overall leader, Subutai was the actual commander in the field, and as such was present in both the northern and southern campaigns against Kievan Rus'. He personally commanded the central column that moved against the Kingdom of Hungary, and likely gave detailed instructions to his subordinates. Though the Mongol methods of warfare were mostly a mystery in the west, the King of Hungary, Bela IV, was well-informed of the Mongol invasion of Russia and prepared as well as the fractured relations of Europe would allow him to. Though Bela was unable to obtain help from the Holy Roman Empire or the Pope, he did at least have the support of his cousins in Poland. Once again, Subutai invaded during winter, when they would be least expected. The Mongol invasion of Europe was a five-pronged attack. Kaidu and Orda Khan ravaged Northern Poland, Baidar Southern Poland, while Shiban attacked through the rugged terrain in northeastern Hungary, Subutai and Batu invaded central Hungary, and Guyuk marched south through Transylvania. The Mongols dispersed their forces in order to confuse the Europeans as to their ultimate objectives, and defeat the European armies piecemeal before they could mass into a central force. After a series of sweeping victories Baidar and Kadan regrouped their northern force and defeated the main Polish army at the Battle of Legnica, right before it could merge with the Bohemian Army a days march away. While Güyük's army triumphed in Transylvania, a day after Legnica, Subutai was waiting for the Hungarian army on the Hungarian plain. Though the Hungarian King Bela IV had effectively blocked the Carpathian passes using felled trees, ditches, traps, and other natural obstacles, in addition to the general disrepair or simply nonexistence of roads in eastern Hungary, Subutai's force still managed an astonishing pace of 60 miles a day despite several feet of snow. The Mongols retained a pioneer corps capable of efficiently clearing pathways through the forest, and were unfazed by Bela's obstacles. One singular feature of Subutai's invasion was how many European forces were defeated in detail, unsupported by their comrades. The combination of the winter invasion, the sheer speed of Mongol advance, Subutai's method of dividing his army into so many different divisions that could threaten several objectives at once prevented the Polish and Hungarians from effectively coordinating their forces to both defend their cities and fortresses as well as massing into one powerful army to resist the Mongols in force. Though Liegnitz (Poland) and Mohi (Hungary) were the big battles, the Mongols also won numerous other victories over smaller, isolated enemy divisions. Contrary to European warfare at the time, when the Mongols won a battle, they ruthlessly pursued or trapped the enemy, destroying armies almost to the man. The Mongols defeated Polish armies at Sandomierz, Tursko, Chmielnik (18 March 1241), Tarczek, Kronstadt (31 March 1241), and Opole. Most notably, the Mongol armies in Poland combined to defeat Duke Henry II's army at Liegnitz (9 April 1241) when his cousin King Wencelas I of Bohemia was just one days march away with an army of 50,000 men. Instead of Wencelas and Henry being able to combine their forces into one mighty army, Henry's army was annihilated, and Wencelas retreated in fear to a castle and played no part in the invasion. In Hungary, the Mongols defeated the Count Palatine in the upper Tisza Valley (12 March 1241), the Transylvanians at Rodna, two more armies and the castle at Oradea, even ravaging as far as Moldavia and Wallachia, and slaughtering the army of Archbishop Ugolin at Kalocsa by luring his army into a marsh in his own territory. While eastern Hungary was being ravaged by the Mongols, and his once-allies the Cumans looted western Hungary, King Béla IV of Hungary had summoned a council of war at Esztergom, a large and important settlement upriver from Buda and Pest. As Batu was advancing on Hungary from the northeast, the Hungarian leadership decided to concentrate their strength at Pest and then head north to confront the Mongol army. When news of the Hungarian battle strategy reached the Mongol commanders, they slowly withdrew to the Sajo River, drawing their enemies further away from their bases. This was a classic Mongol strategy, ultimately perfected by Subutai. He prepared a battlefield suitable to his tactics, and waited for his enemies to blunder in. It was a strong position, because woods prevented their ranks from being clearly scouted or seen, while across the river on the plain of Mohi, the Hungarian army was widely exposed. However, the perceptive King Bela did not walk into the trap. Only one day after the smaller Mongol army in Poland had won the Battle of Legnica, Subutai launched his attack, thus beginning the Battle of Mohi during the night of April 10, 1241. At Mohi, the Mongols fixated the Hungarian attention in the center by assaulting the lone bridge and attempting to ford to the north and around the bridge. The main body began to cross the Sajo by the bridge at Mohi, and continued to attack the following day. This was met with fierce resistance, so catapults were used to clear the opposite bank of crossbowmen, as was noted earlier. Meanwhile, Subutai in secret created a pontoon bridge to the south, where the river was too deep to be forded, and crossed the river in secret with a large force. When the crossing was completed, the second contingent attacked from the south, and a third from the north. The threat of now reassembled Mongol force, enveloping the Hungarian army on the far side of the Sajo river, forced the Hungarians to retreat into their wagon laager camp, a traditional tool of fighting against nomadic armies. However, the Mongols surrounded the fortified Hungarian camp, and bombarded it with trebuchets, gunpowder weapons, and flaming arrows. Hungarian cavalry charges were lured further away from their camp and encircled. The result was complete panic; and to ensure that the Hungarians did not fight to the last man, the Mongols left an obvious gap in their encirclement. This was one of Subutai's classic tricks, to create a tactical situation which appeared to be favourable to the enemy. Subutai did not want a battle where the massed crossbowmen, supported by mounted knights, stood firm and fought to the death against his army. He far preferred to let them flee and be slaughtered individually. The apparent gap in the Mongol lines was an invitation to retreat, which would leave the knights and crossbowmen spread out all over the countryside, easy pickings for the disciplined Mongols. As Subutai had planned, the Hungarians poured through this 'hole' in the Mongol lines, which led to a swampy area, poor footing for horses and hard going for infantry. When the Hungarian knights split up, the Mongol archers picked them off at will. It was later noted that corpses littered the countryside over the space of a two-day journey. Two archbishops and three bishops were killed at the Sajo, plus more than 10,000 fighting men. In one stroke, the bulk of Hungarian fighting men were totally destroyed, but Mongol casualties in the center had been higher than normal: in addition to anywhere from many hundreds to many thousands of regular soldiers, Batu lost 30 of his 4,000 strong ba'aaturs (heavily armored bodyguards) and one of his lieutenants (Bagatu/Bakatu), which caused tension later in the camp. The after battle tensions reached its climax at a very argumentative feast. One unique feature of this campaign, due to the large number of princes, was that in addition to defeating the enemy, Subutai also had to spend substantial energy keeping the egos of the Mongol princes in check. During the battle, Subutai had to shame Batu into continuing the fight after the first failed attack on the bridge. Batu first blamed Subutai for taking too long to ford the river, but Subutai rebuffed him by saying that they knew fording the river would take time, and Batu had launched his attack preempetively. In the end Batu apologized to Subutai. This was not the first time that Subutai had to bail Batu out of a mistake: during the invasion of Russia, Batu had struggled for weeks to conquer the fortress of Torzhok, launching several failed assaults. Subutai had to divert his movements, take command, and conquered the fortress in 3 days with ease. Either at this feast or another one shortly after, Batu got into a heated argument with the Mongol princes Guyuk and Buri. Guyuk and Buri, jealous of Batu, accused Batu of incompetence and riding Subutai's coattails. 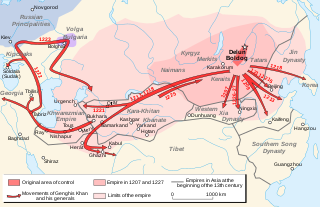 This resulted in Guyuk and Batu, and possibly some of their men being sent home to Ogedei Khan for judgment, causing further rifts in the Mongol army. Despite these obstacles, the Mongols solidified their control over Hungary. Subutai was never content just winning on the battlefield. He, like Genghis Khan, wanted to completely crush the enemy's will, and would take highly unusual steps to achieve this. For example, they would use merchants who formed the extensive Mongolian spy network to spread false rumors and enhance the terror of the Mongols. This may have contributed to the panic of the Hungarians in the eve of the invasion which led the Hungarians to lynch the Cuman king Koten and drive a rift between the Cumans and the Hungarians. The Hungarians seem to have attempted guerrilla warfare, but it never really got off the ground. The Hungarian guerrillas lacked the support of the population because any areas which resisted were massacred or taken captive by the Mongols. After the defeat of the Hungarians at Mohi, Subutai used a stolen royal seal to issue bogus decrees across the country, leaving many unassuming inhabitants at his mercy. The Mongols would sack a town and pretend to depart, only to hide and return shortly thereafter to kill everyone who had been hiding under rubble or in the forests. In other instances they enlisted willing Hungarians to organize their brethren to work at Mongol direction, or spread false word of a general amnesty being ordained. In order to keep the pressure on Bela, Subutai split his forces into several detachments. A light cavalry force under Kadan was sent to chase King Bela along the Adriatic Coast, while the main army with its siege engines under Subutai and Batu pacified Hungary proper. Other Mongol forces raided outside the borders of Hungary, even reaching Austria. The Mongols successfully besieged numerous cities, including the fortified city with a stone citadel at Oradea, the castle of St. Martin of Pannonia, and the capital Esztergom. In the west, Kadan's army was unable to catch Bela, and lacking siege equipment, he could not forcibly capture the Adriatic cities. However, Bela, hiding on the island of Trau in the Adriatic, was also unable to effectively rally his people due to his flight, which meant that Hungary was at the total mercy of the main Mongol army who could simply capture cities in succession like they did in Khwarezm. Batu and Subutai began setting up administrative control and extended their administration into western Hungary and Wallachia in the winter of 1242. By early 1242, Subutai was discussing plans to invade the Holy Roman Empire, when news came of the death of Ögedei Khan and a revolt by the Cumans in Russia. Over the objections of Subutai, the Mongol Princes withdrew the army to Mongolia for the election of a new Great Khan. The death of Ögedei effectively put an end to the Mongol invasion of Europe. The Mongols always practiced a 'Tsunami Strategy' of temporarily retreating from the furthest outlying provinces they had won to avoid overextension, only to return shortly after their closer conquests were properly solidified. However, the death of Ogedei and the turmoil immediately after it prevented the Mongols from returning to Europe for decades. Still, the devastation had been immense. Subutai had devastated the agriculture of any area that was resisting. Though some of the civilians had escaped capture or death by hiding in castles, forests, or marshes, they returned to their ruined fields only to starve. As a result, probably over a quarter to a half of Hungary's population died from the invasion. A Bavarian Monk tersely recorded in 1241 that “In this year, after existing for 350 years, the kingdom of Hungary was annihilated by the Tatars.” Even in 1250, 8 years after the Mongols had left, Hungarian King Bela wrote to the Pope that Hungary could not withstand another invasion and would have to surrender to the Mongols if they returned. On the way out of Europe, the Mongols plundered the yet untouched lands of Bulgaria and encountered the army of Baldwin II, Latin Emperor of Constantinople. Though Baldwin defeated a small skirmishing force, he was apparently lured into overconfidence and suffered a severe defeat. After subduing a Cuman revolt in what is now Russia, another possible reason for departing Hungary so suddenly, Subutai turned towards Mongolia. Subutai insisted that Batu attend the kurultai to elect the successor of Ogedei in Mongolian heartland. Batu declined to come and Güyük was elected after three years, with Subutai's support. Güyük had no love for Batu and wanted the best of the Mongol generals unavailable to Batu if the feud between them came to open war. The new Khagan placed Subutai in charge at the age of 71 of the campaign against the Song dynasty for 1246–1247. The Papal envoy Plano Carpini saw him when he was in Karakorum, Mongolia. He said Subutai was well respected among the Mongols and called Knight/Valiant/Hero (translation of Baghatur). Subutai returned to Mongolia from the Song campaign in 1248 and spent the rest of his life at his home in the vicinity of the Tuul River (near modern Ulaanbaatar), dying there at the age of 72. His descendants such as Uryankhadai and Aju would serve the Great Khans for the next three decades as commanders. Uriyangkhadai would successfully conquer the kingdom of Dali, invade Dai Viet and obtain their submission, and achieve great success invading the Song from the southwest in the 1258 invasion of Mongke Khan. Aju fought with his father, and then later led the successful 5 year Mongol siege of the pivotal dual fortress of Xiangyang-Fancheng in the battle of Xiangyang, which opened up a gateway into the heart of the Song and enabled their total conquest 6 years later in 1279. No Mongol general played a greater role than Subotei Ba'atur in establishing and maintaining the early Mongol Empire. 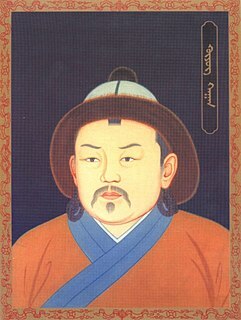 Trusted commander and retainer of Cinggis, later highly respected servant of Ogodei and Guyuk, Subotei served with great distinction in every phase of Mongolian national development during the first four decades of empire. When he first entered the service of Temujin, the later Cinggis Qan, the realm of that minor Mongol chieftain comprised only a few families. In his old age, Subotei saw a mighty dominion stretching from the borders of Hungary to the Sea of Japan, from the outskirts of Novgorod to the Persian Gulf and the Yangtze River. He had no small part in creating it. In a unique historical anomaly, the strategic and operational innovations of Genghis Khan and Subutai became lost in history, and others were forced to rediscover them 600 and 700 years later. Even though Subutai had devastated the armies of Russia, Georgia, Hungary, Poland, Bulgaria, and Latin Constantinople in a series of one-sided campaigns, Western military leaders, historians, and theorists completely ignored him until the 20th century. As a result, after adding onto the innovations of Genghis Khan, Subutai's armies fought unlike any force in history until the Germans and Russians in World War II, seven hundred years later. They did not operate as one distinct mass, but instead moved along 3-5 axes of approach, often 500–1000 km apart, and threatened numerous objectives simultaneously. Like Napoleon, Subutai (and Genghis Khan) would disperse their forces along a wide frontage and rapidly coalesce at decisive points to defeat the enemy in detail. However, unlike Napoleon, the Mongols retained the flexibility to dispatch armies to the widely separate fronts, through inhospitable terrain or during the most unexpected times of year, often using some armies purely as means of fixing enemy attention and fomenting division in their enemies greater than any other army in history. Their methods were aligned to completely crush the enemy state's will to fight, not merely to defeat their armies and hope they surrendered, as Napoleon had. Subutai has been credited as the first general to operate campaigns using the modern organizational methods of command and control. Though unknown to the west for many centuries, Subutai's exploits were first featured by the British Military theorist B.H. Liddell Hart in his book "Great Captains Unveiled" after World War I. Liddell Hart used the example of the Mongols under Genghis and Subutai to demonstrate how a new mechanized army could ideally fight using the principles of mobility, dispersion, surprise, and indirect means. Though he gained little support in Britain, Liddell Hart's books were read in Germany, whose armies during the initial 1940-1 invasions of France and Russia bore an astonishing similarity to the campaigns of Subutai, 700 years earlier. In particular, Erwin Rommel and George Patton were avid students of Mongol campaigns. Russia derived the most use out of a careful study of the Mongol campaigns. Their closer proximity to the steppe gave them greater interest and access to the Mongolian campaigns, first analyzed by the Russian General Mikhail Ivanin in the 19th century, which became a recommended text in the Russian military academics up until the mid 20th century. Ivanin's work became used in the Deep Battle doctrine developed by Soviet Marshal Mikhail Tukhachevsky, Mikhail Frunze, and G.S. Isserson. Deep Battle doctrine bore a heavy resemblance to Mongol strategic methods, substituting tanks, motorized troop carriers, artillery, and airplanes for Mongol horse archers, lancers, and field artillery. The Red Army even went so far as to copy Subutai's use of smokescreens on the battlefield to cover troop movements. Later in the 20th century, American Military theorist John Boyd and some of his followers used Genghis Khan and Subutai's campaigns as examples of maneuver warfare. Nicolle, David (1998). The Mongol Warlords, Brockhampton Press. Reagan, Geoffry (1992). The Guinness Book of Decisive Battles, Canopy Books, NY. Sicker, Martin (2000). The Islamic World in Ascendancy: From the Arab Conquests to the Siege of Vienna, Praeger Publishers. Soucek, Svatopluk (2000). A History of Inner Asia, Cambridge University Press. ^ Gabriel, Richard. "Genghis Khan's Greatest General Subotai the Valiant". University of Oklahoma Press, 2004, p. 6. ^ Tsendiin Damdinsüren (1970). "120 (III)". Монголын нууц товчоо [The Secret History of the Mongols] (in Mongolian) (1st ed.). ^ Gabriel 2004, pp. 1, 3. ^ Cummins, Joseph. History's Great Untold Stories: Larger Than Life Characters & Dramatic Events That Changed the World. 2006. Washington D.C.: National Geographic Society, 2006. Print. ^ Gabriel, Chapter 8; Carl Svedrup, Sube`etei Ba`atur, Anonymous Strategist. ^ Chris Peers, the Mongol War Machine (2015), 157-159. ^ Timothy May, the Mongol Art of War. ^ Matthew Paris, Chronica Majora, 341-45. ^ Yuan Shih, Biography of Subedei, 121.2975-76. ^ Juvaini, History of the World Conqueror, 370-1. ^ Juvaini, History of the World Conqueror, 373-85. ^ Juvaini, History of the World Conqueror, 375-410. ^ In the Service of the Khans, 19. ^ Frank McLynn, Genghis Khan, 319. ^ Kirakos Gandzaketsi, History of the Armenians, 166-167. ^ Oliver of Paderborn, 'The Capture of Damietta', trans. Joseph J. Gavigan, Christian Society and the Crusades, 1198-1229, ed. Edward Peters (Philadelphia: University of Pennsylvania Press, 1971), 90, 123-124. ^ Frank McLynn, Genghis Khan (2015), 607-613. ^ In the Service of the Khan, Paul Buell, 17-18. ^ Rashid al-Din, Annals of Ogedei Khan, 33. ^ Christopher P. Atwood, Pu'a's Boast and Doqolqu's Death: Historiography of a Hidden Scandal in the Mongol Conquest of the Jin, 31. ^ Christopher P. Atwood, Pu'a's Boast and Doqolqu's Death: Historiography of a Hidden Scandal in the Mongol Conquest of the Jin, 31-41. ^ Yuan Shi, Biography of Subedei, 121.2977. ^ Carl Svedrup, Sube`etei Ba`atur, Anonymous Strategist, 41-43. ^ The Chronicle of Novgorod (1914), 83. ^ Paul Lendvai, The Hungarians: A Thousand Years of Victory in Defeat. ^ Jan Dlugoscz, Annals, 180-1. ^ Yuan Shih, Biography of Subedei, 121.2978. ^ Denis Sinor, The Mongols in the West (1999), http://deremilitari.org/2014/07/the-mongols-in-the-west/. ^ Hodong Kim, A Reappraisal of Güyüg Khan, 319-20. ^ Urgunge Onon, The Secret History of the Mongols, 270. ^ McLynn, 472-9; Thomas of Spalato, Historia; Rogerius of Apulia, Carmen Miserabile super Destructione Regni Hungariae per Tartaro. ^ John of Plano Carpini, The Story of the Mongols whom we call the Tartars. ^ Timothy May, The Mongol Art of War and the Tsunami Strategy. ^ McLynn, 479; Carmen Miserabile. ^ Paul Lendvai, The Hungarians: A Thousand Years of Victory in Defeat, 49. ^ Brief König Belas IV. an Papst, 310. ^ Ed. Igor de Rachewiltz (1993). In the Service of the Khan. ^ LTC Sean Slappy, Command and Control Began with Subotai Bahadur (2010). ^ edited by James C. Bradford, International Encyclopedia of Military History. ^ John Boyd, Patterns of Conflict, www.dnipogo.org%2Fboyd%2Fpatterns_ppt.pdf&usg=AOvVaw3ChQWbjxE4L14on5HQ6Z8c. ^ LTC Joe E. Ramirez, Jr, Genghis Khan and Maneuver Warfare (2000). Güyük was the third Great Khan of the Mongol Empire, the eldest son of Ögedei Khan and a grandson of Genghis Khan. He reigned from 1246 to 1248. Töregene Khatun was the Great Khatun and regent of the Mongol Empire from the death of her husband Ögedei Khan in 1241 until the election of her eldest son Güyük Khan in 1246. The Battle of the Kalka River was fought between the Mongol Empire, whose armies were led by Jebe and Subutai the Valiant, and a coalition of several Rus' principalities, including Kiev and Galich, and the Cumans. They were under the joint command of Mstislav the Bold and Mstislav III of Kiev. The battle was fought on May 31, 1223 on the banks of the Kalka River in present-day Donetsk Oblast, Ukraine, and ended in a decisive Mongol victory. Muqali, also spelt Mukhali and Mukhulai, was a Mongol slave who became a trusted and esteemed commander under Genghis Khan. The son of Gü'ün U'a, a Jalair leader who had sworn fealty to the Mongols, he became known by his epithet "Muqali", "the Darling", earned through his committed and able service to the Great Khan and the Mongol Empire. 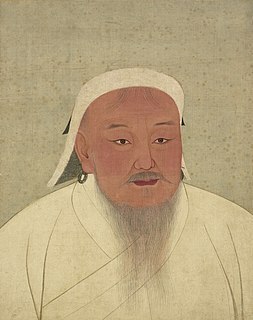 During the invasion of Jin China, Muqali acted as Genghis Khan's second-in-command, and was promoted to Viceroy of China, and was entrusted with a great degree of autonomy once Genghis Khan departed to conquer Central Asia. Unlike many Mongol leaders who were willing to massacre to gain any advantage, Muqali usually attempted to convert foes into friends by more conciliatory means, and change the Mongol image in China. By the time of Ogedei's reign (1229-1241), he was viewed as the best of the extraordinarily talented pool of Mongol generals. Given his undefeated record despite very limited resources, he is likely one of the greatest military commanders in history. The Mongol conquest of the Jin dynasty, also known as the Mongol–Jin War, was fought between the Mongol Empire and the Jurchen-led Jin dynasty in Manchuria and north China. The war, which started in 1211, lasted over 23 years and ended with the complete conquest of the Jin dynasty by the Mongols in 1234.